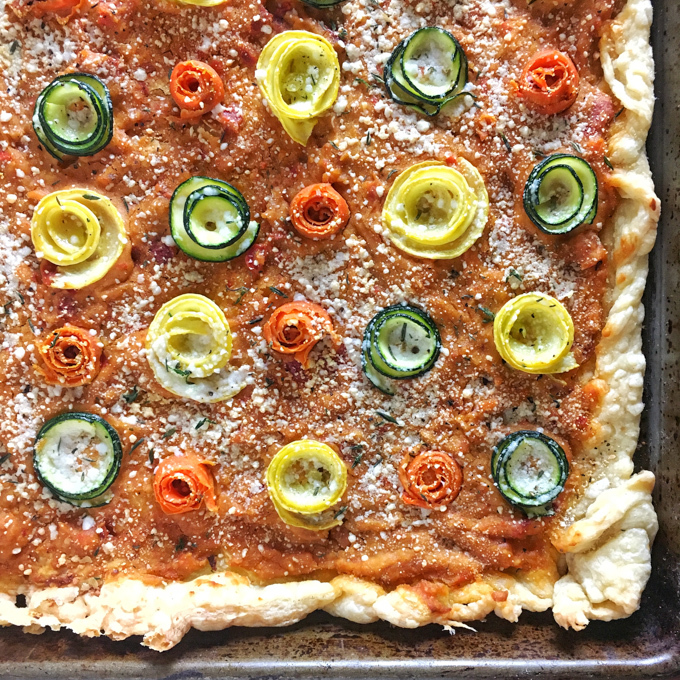 A crowd-pleasing appetizer made with hummus, puff pastry, zucchini, squash and carrots! But for the past few weeks, I’ve been in hummus heaven thanks to the lovely folks at Sabra Dipping Compay. This month, The Recipe ReDux is partnering with them for a sponsored recipe contest. And I’ve been trying ALL the samples of their flavored hummus and really haven’t been able to pick out my favorite yet. 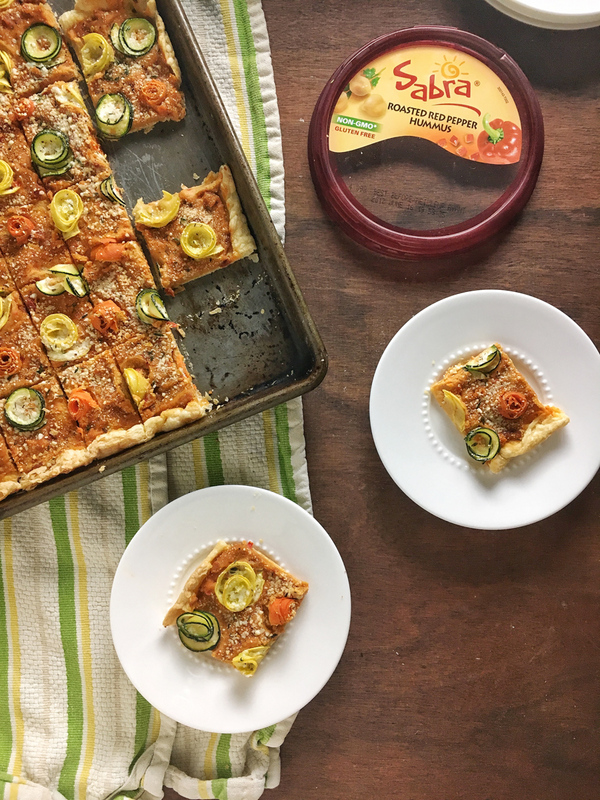 Sabra challenged us ReDuxers to create an appetizer or snack recipe using Sabra Hummus that was either gluten-free, vegetarian or vegan or could fit into the Mediterranean diet. Clearly, by this recipe title, I chose the latter as the Mediterranean diet is made up of the foods I routinely eat and love, which includes plant-based proteins like Sabra hummus <—– #chickpealove. 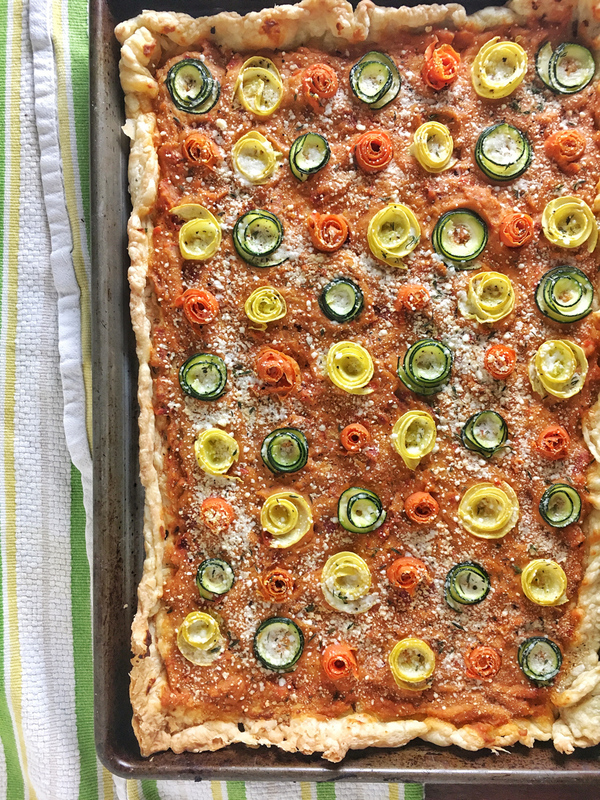 So, I wanted to feature the veggies on this tart in a different way. When apple “roses” were are all over the Internet last year, I took a crack at them and made these Chocolate Pear Roses for Healthy Aperture. So I figured, why not try this same technique with veggies? I’ll admit, it took several tries to figure out the best way to slice my zucchini, yellow squash and carrots but in the end, I was happy with the results. 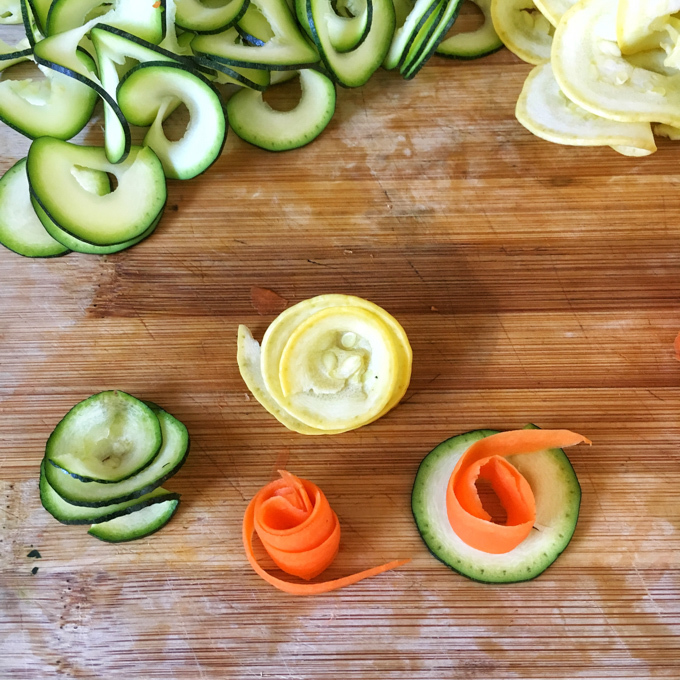 I found that using the straight/accordion blade on my spiralizer (<—- affiliate link!) worked best for the zucchini and squash while my basic vegetable peeler worked best for the carrots. You could also use a mandoline, slicing the veggies lengthwise, but I’m not talented enough to do that without removing a finger tip! Now, this recipe does take a little more time that the typical recipes we feature here but this appetizer will definitely be a hit at your next barbecue or family celebration – both in the look and taste department. On a lightly floured surface, roll out puff pastry into 13 x 17-inch rectangle. Coat 9 x 13-inch sheet pan with cooking spray. Place puff pastry in sheet pan, pressing dough up the sides of the pan. With a fork, prick the dough across the entire pan. To prep vegetables, either peel into thin long strips (about 4 – 5-inches) with a mandoline, a spiralizer (using straight/accordion blade) or a vegetable peeler. Gently spread Sabra hummus over the baked pastry. Brush the veggie roses with olive oil. Sprinkle thyme, black pepper and cheese over top. Bake for another 15 minutes. Remove from oven and using a pizza cutter, cut into 30 squares. Serve immediately. And the great thing is you can experiment with different veggies and different Sabra hummus flavors. I made my tart with the Sabra Roasted Red Pepper Hummus but it would also be delish with their Roasted Pine Nuts, Roasted Garlic or Sundried Tomato flavors. What a fun idea! I love the veggie flowers… I’m going to start putting them on everything!!! Haha – I was putting them on my ricotta toast the next day! I’ve always wanted to try making something like this–it’s absolutely beautiful! <3! Your rose veggies are so pretty! This tart is definitely a crowd pleaser! This is such a pretty appetizer & I love how creative you are! I don’t think I would even attempt to make a rose out of any type of food~it would be a disaster 🙂 I hope you’re having a wonderful time in NYC-what a fun place to celebrate National Hummus Day!